In an effort to help with that quest, I have contacted working professionals in the field (not just (non-reporting) trainers) and asked them to tell you (yes, you!) why they use the CAT software they use -- their likes, dislikes, etc. 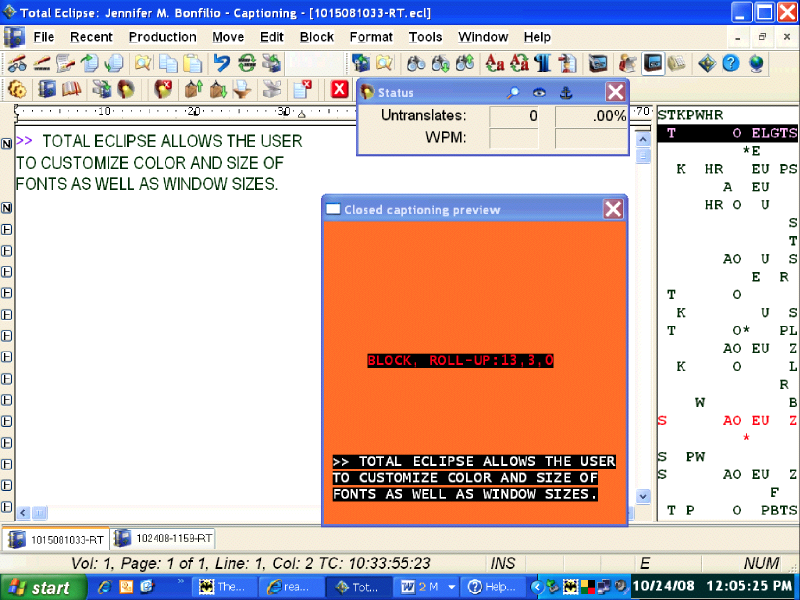 ... and I managed to convince captioner extraordinaire to write this piece on AccuCap, Eclipse's captioning add-on. My name is Jennifer Bonfilio. I have been in the biz for 25 years -- 16 as a freelance reporter, 14 as a CART provider, and 10 as a broadcast captioner. Of course, that doesn't add up to 25 because there was some overlap in there, but -- trust me -- it's been a long time. As far as software goes, I've used 'em all ... well, not quite all, but I started on Stenograph. It was so long ago, I don't even know what it was called. Oz PC maybe? Baron Data? It was the '80s; I've blocked out a lot from the '80s! All I know is it had a huge disc that contained every reporter's dictionaries, and new reporters like myself were not allowed alone in a room with it! 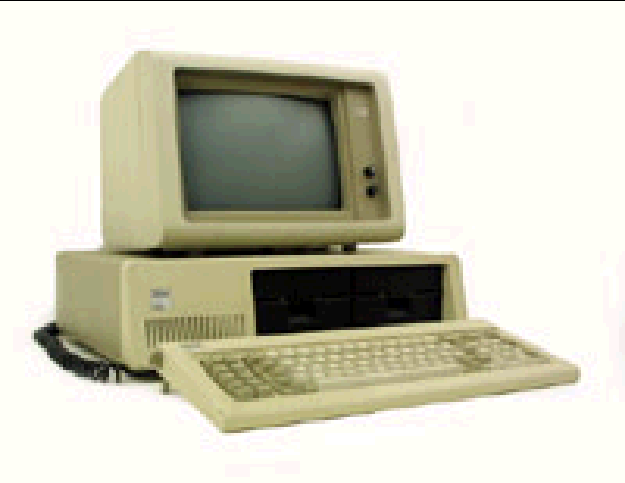 All I know is it had a huge disc that contained every reporter'Â€Â™s dictionaries, and new reporters like myself were not allowed to be alone in a room with it! Next came Xscribe, which I really loved, but they were bought out and I decided to become a captioner. I took a job working in-house for a large captioning company, and TurboCat/Captivator was the software we all had to use. Unfortunately, I never really gained a good understanding of the software because we had support staff that took care of creating macros and the like. We were just sheep (followed directions). It left little room for creativity and digging deep. 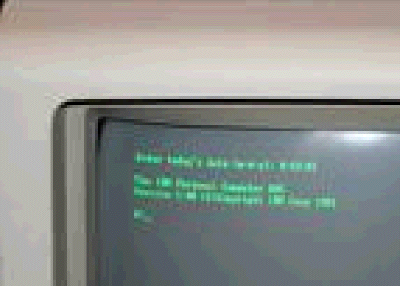 Plus it ran on DOS, and ... well, what can I say about DOS? It's not very pretty? 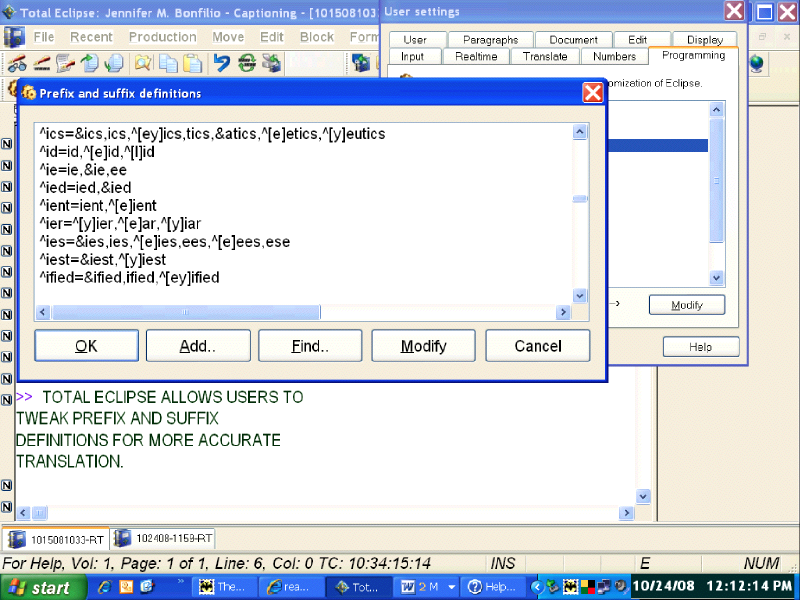 It's no wonder I am in absolute love with my current CAT software: Total Eclipse and AccuCap (the captioning add-on). "Ah, DOS ... How Do I Loath Thee, Let Me Count The Ways ..."
I've never been very good at reading manuals. It's not that I can't read them; I just choose not to. I prefer to "turn it on and go" and hope for the best. This is not the best approach to learning something new, but that's just me. The other factor at the time I purchased Eclipse was my limited time in getting up and running as I transitioned from working in-house, moving back to my home state, setting up a home office, and going on the air. So I did what many reporters do: I plugged the realtime cable in from my steno machine to the computer, closed my eyes (peeking slightly from one eye), clicked on the realtime icon, and voila! I had realtime. Okay, maybe not on the first try, but I figured it out pretty quickly. Of course, all of the formatting was wrong. I needed to change the fonts and colors to my liking, but I was connected, and that's all that mattered on that day. I should note, as well, that there was no AccuCap manual in existence at that time. I spoke often on the phone (daily!) with John Everhart (miracle worker), my Eclipse sales rep, who put up with my unconventional way of learning the software as quickly as possible. He answered all my questions, and when he didn't know, he called Jeremy Thorne (genius), Advantage Software's (aka ASI, makers of Eclipse) software writer and got me answers. He was even nice enough to extend the evaluation copy terms from 30 days to 45 days, as I was in the middle of purchasing a house and was advised not to open up any credit accounts until after the closing. This allowed me to learn the software and get all set up without paying for it yet. Now, that's customer service! There is a feature called Auto Dial (E!). If the modem drops, it will automatically redial without the captioner having to stop writing. Not only does this save the captioner valuable time, but if a text file is being prepared for re-feeds and/or repeats, the file will be complete without gaps. In my opinion, one of the best features is the prefix and suffix definitions, which are accessible to the user to add, modify, or delete. To my knowledge every other CAT software that exists uses basic grammar rules to determine whether to change the spelling of a root word when a prefix or suffix is added to it. Eclipse uses those same rules; however, it also will try to match the newly spelled word with the spellchecker (E!). That prevents it from doubling a final consonant, for example, if the particular word in question happens to be an exception to the rule. In addition, there are many word parts in steno that act like prefixes and suffixes that can be added. For example, the "suffix" --KAL. Technically, the word MEDICAL's suffix is IC/AL, but many of us to save strokes will write MED/KAL. I've created a suffix K*AL to differentiate it from words beginning with KAL and entered CAL (English spelling) into my suffix table as CAL and ICAL. So when I write MED/KA*L, Eclipse first looks for MEDCAL in the spellchecker. When it doesn't find a match, it moves on to MEDICAL. This is an extremely powerful tool that if tweaked properly can save thousands of dictionary entries. Not only will Eclipse tuck the comma and the period automatically, but it will tuck suffixes (E! ), thus eliminating the need for an entry for "BATMAN'S" or a made-up word like "BATMAN'D." The scripting feature has been improved significantly over the years. If you send script along with writing realtime, the scripted portion will be inserted into the realtime file along with whatever is written in realtime resulting in a complete file at the end of the session (E!). You can also send any portion of a realtime file as a script. For example, if you write an hour of news and during the second hour of the newscast, they repeat a story from the first hour, you can go to the top of the file and search for a keyword and begin sending (E!). Speaking of improvements, the developer of Eclipse creates development versions every week or two that are accessible on the website to users. If a user does not feel comfortable using those versions, they certainly do not have to; they can stick with the release versions, which come out yearly. There are those of us who use the development versions regularly and report problems to the developers so they can be fixed. One of the benefits is getting to use new features long before the general user population. Advantage Software has a website, http://www.eclipsecat.com, which includes a users forum. This is an invaluable tool for users to ask questions, post comments or problems, and oftentimes communicate directly with the developer of the software (E!). I believe this is one of the reasons the software is as good as it is. The developers welcome the feedback as well as wish lists. Software support is very expensive, regardless of which software you choose. I look at it as a necessity and an ordinary business expense. Support staff is available 24/7 at ASI, and there is a policy that they return a call within 30 minutes. This policy was put in place as a direct result of captioner requests since a captioner's working day is around the clock. The user forum can be a very valuable tool for support because there are so many very knowledgeable users that are willing and able to help other users day and night. It's a real tight-knit "family," if you will. Not only that, but there are many captioners on the forum as well as an AccuCap section just for captioning questions. Many of them are extremely familiar with the software and are always willing to help someone in need. In my opinion, the user forum alone is worth its weight in gold. There are some really new and nifty features -- Translation Magic (E!) and Autobrief (E!). Translation Magic looks at an outline and tries to find something close in your dictionary that it "thinks" you might have been shooting for. It's pretty darn accurate. I would say out of ten items, it gets eight right. Unfortunately, it's those two times that I was writing something phonetically intentionally, say a name, and instead of getting the phonetic outline, I'll get some word in my dictionary. But it just kills me that I can't use it (at this time) because of those two other times that it was not right. A solution for me would be to only fingerspell those types of names and let TM do its thing. I am actually considering using Translation Magic again because it is so awesome. And I have asked Jeremy to create a way, perhaps by way of macro, to temporarily turn it off as I'm writing. Autobrief, again, can be a lifesaver in certain situations. If you write a name or multiple words more than once, Autobrief will offer you an instant brief. If you decide to use the brief, all you have to do is use it. If you don't want to use it, you simply ignore it. Again, when I have used it, it's been absolutely amazing. The problem I have with it is it offers briefs I would never choose myself, outlines that could possibly be a word part, for example, or very difficult to physically maneuver your fingers around. I would love to see an option that I could tweak this feature to my personal preferences. In other words, I would like to be able to define the types of briefs it offers. Well, ask and you shall receive :o). In a recent development version, 4.2.1.0., Jeremy has incorporated a feature that allows the user to create rules that Autobrief must follow before offering briefs. This feature is so new that I have had very limited time to play with it, but it looks like with some tweaking, I may be able to turn this feature on in the near future! Depending on how comfortable one is with artificial intelligence, some captioners may not choose to use these features. I have tested them off-air and used them on-air. They are both incredible features. Eclipse is incredibly user friendly in that you can open dictionaries, transcript files, steno note files, and user settings while in a realtime session or otherwise. There are no limitations. One of the coolest things, though, is if you are already in a realtime session and you discover you have the wrong job dictionary loaded or forgot to add a dictionary to this session, you can add (E! ), change (E! ), or remove (E!) dictionaries from the current translation, and the changes are effective immediately (E!)! In addition, you have the ability to modify your screen and resize any window you choose to have open during a realtime session. You can change the display settings as they relate to colors, sizes, and fonts to your personal preferences. You can even customize the toolbar (E!)! There have been some major enhancements to dictionary management and search features. The dictionary search feature is so powerful and there is so much it can do. I see this as a very significant feature for captioners switching from another CAT software to Eclipse and for court reporters transitioning into captioning. I remember when I was training how many items I had to search for entries in my dictionary because I was making so many changes in my writing. I was on TurboCat at the time. I also remember switching from TurboCat to Eclipse before these enhancements and how difficult it was to find all that I needed to find quickly and to make mass changes efficiently and accurately. Now it's a breeze. Captioning is all about names. It can be difficult and challenging to keep them straight. Eclipse has a feature in its dictionary handling where a user can make a notation in the comment section of a dictionary entry (E!) which will not go out over the air. Although I have heard of captioners having problems with certain encoders (regardless of what software they were using), I have never had any problem connecting and/or communicating with any encoder in the eight years I've been using Eclipse. The Metadictionary is sort of the brains of the program. Most developers keep the brains off-limits to users. 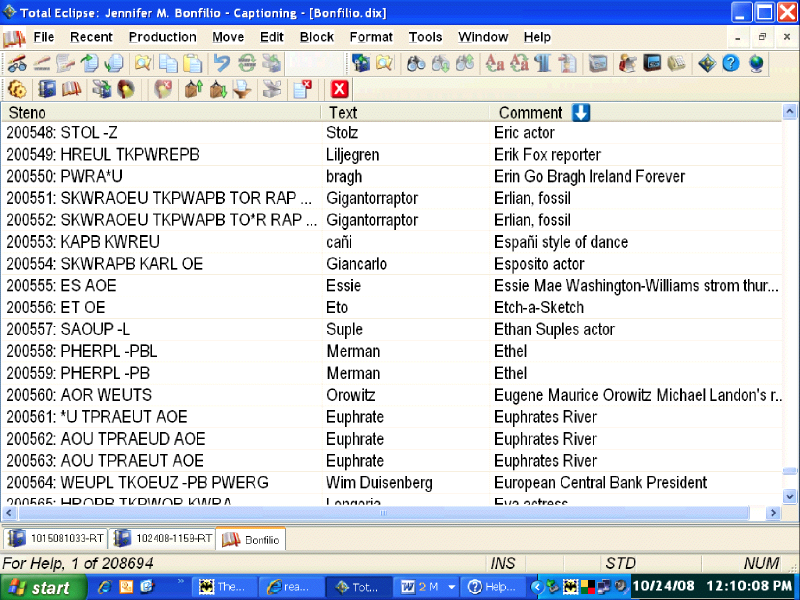 Again, users here have access to the Metadictionary if they want it (E! ), but if they are intimidated by it, they never have to go there. The slop stroke (E!) feature is a great feature. It allows you to define all of the misstrokes of a stroke, for example the question bank, as a slop stroke. If in the future you decide to use the question bank for something other than a Q or >>, the only change you have to make in your dictionary is the clean outline. All of the misstrokes, as long as they are defined as slop strokes, will translate as whatever the clean stroke is defined as. For Captivator users making the switch to Eclipse, there are kits available (E!) for easy transition, although they weren't available when I switched so I can't speak to them. Like most CAT software on the market today, Eclipse has a software key that you must have connected to your computer in order to run Eclipse. A great procedure ASI has in place is if for any reason your key is not functioning, you've lost it, or whatever, you can call and get a code to enter the program (E!). 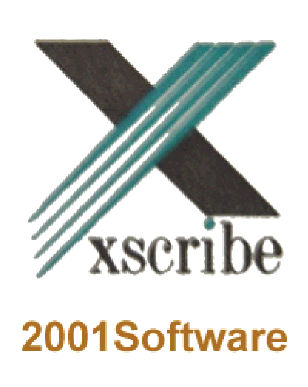 I wish I had that back in the early '90s when my laptop and my only Xscribe 2001 key were stolen. I could not work for over a week until the new key arrived, which they wouldn't even send until they received a police report :o( Speaking of keys, ASI offers a convenience key (E!) for only $300 that can be used on a second computer so you do not have to keep moving the key back and forth when traveling. If you purchase Eclipse, you can use all of the features of AccuCap except dialing out, giving captioners in training the ability to learn the program before making the financial investment of AccuCap ($1,000 to $2,000 on top of the CAT software, depending on promotions). Every writer, including obsolete writers, is supported by Eclipse. Every encoder is supported by Eclipse. In conclusion, as a captioning trainer, I have seen the features and limitations of some of the other captioning software on the market. I work with captioners who do not have scripting capability. I am amazed that you cannot choose the layout of your windows on the screen in Stenograph's BCS (Broadcast Captioning Suite). 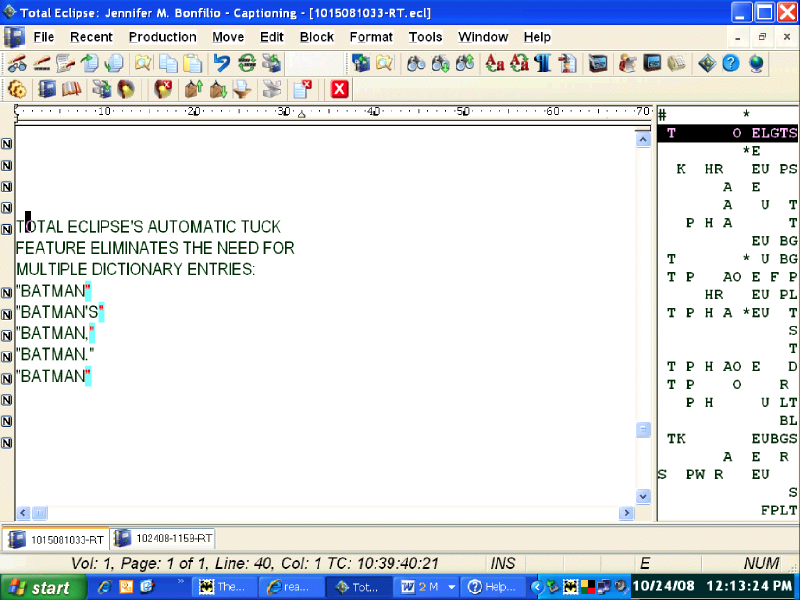 I have used Eclipse AccuCap for nearly a decade, and I cannot imagine using any other software to caption with. I truly believe it is superior to all others that exist at this time. And if you were counting the "E!s" above, you may be surprised that there were 19 features exclusive to Eclipse AccuCap. And those are the only ones I know about! Jennifer M. Bonfilio, RMR-CBC-CCP, is a broadcast captioner. She trains court reporters transitioning into captioning, and she is also a Certified Eclipse AccuCap Trainer. Jennifer can be reached at captions@optonline.net.